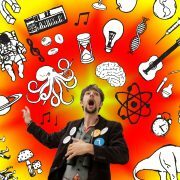 “Writing and performing science songs is the niche field in which I’ve carved out something of a profession over the past decade,” says John Hinton, theatre practitioner, science communicator, and the creator of Ensonglopedia of Science, launched in February 2017, which has a song about science for each letter of the alphabet. Here he shares a personal reflection over the intersection between science and music. The theme of Crastina January–February 2018 is Science & Music. Ever since Pythagoras walked past a blacksmith’s shop in 500BC and heard the differing notes created by anvils of different weights, and wondered whether a mathematical relationship could exist between the weight and the sound, science and music have been unlikely bedfellows. Pythagoras’ grand hypothesis was that the planets circled the Earth at distances that related to the notes on a musical scale, and he even claimed to hear’ this Music of the Spheres (though he also claimed to have a thigh made of gold, and that he could remember all his past lives; the criteria for scientific validity were a little more lax in those days). Many famous scientists have been musicians on the side. Is this coincidence, or is there something neural that ties the two pursuits together and makes, essentially, a scientific mind and a musical mind the same kind of mind? * In a 1929 interview, Einstein said, get most joy in life out of my violin”, and also made the extraordinary claim often think in music.” Richard Feynman was apparently a bit of a whizz at the bongos. And you’ll meet more contemporary examples of scientists who dabble in – or even earn part of their living from – music here at crastina.se. In all these examples, though, science itself does not feature strongly in the music. Though the two pursuits may activate similar neural pathways, there does not appear to be much attempt to address scientific learning in the music produced by scientists. Einstein wrote a popular book explaining relativity to the layman, but he didn’t write a violin concerto to accompany it. Feynman, when he did accompany his bongo playing with words, seems to have sung mainly about range juice. Perhaps, in these cases, music acts as downtime for the brain, a mental massage that fires the synapses towards greater scientific achievement. To write songs about science, it seems, you have to be a non-scientist. Which qualifies me perfectly. Yes, there are exceptions: Tom Lehrer was a mathematician and scientist who sang about both of these fields. But most writers of brilliant songs about science**, amongst whom I’d include Michael Flanders, Eric Idle, and the two Johns of They Might Be Giants, have no science training whatsoever. Why is that, I wonder? I don’t know. But as soon as I find out, I’ll write you a song about it. 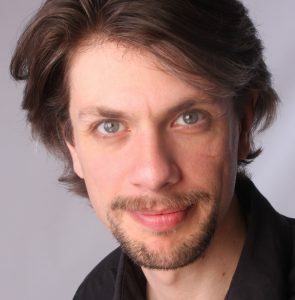 John Hinton is a theatre practitioner and science communicator based in Brighton, UK. His ‘Scientrilogy’ of musical comedies, in which he plays Charles Darwin (The Origin of Species…), Albert Einstein (Albert Einstein: Relativitively Speaking) and Marie Curie (The Element in the Room), have won multiple awards internationally and have toured almost continually since 2009. 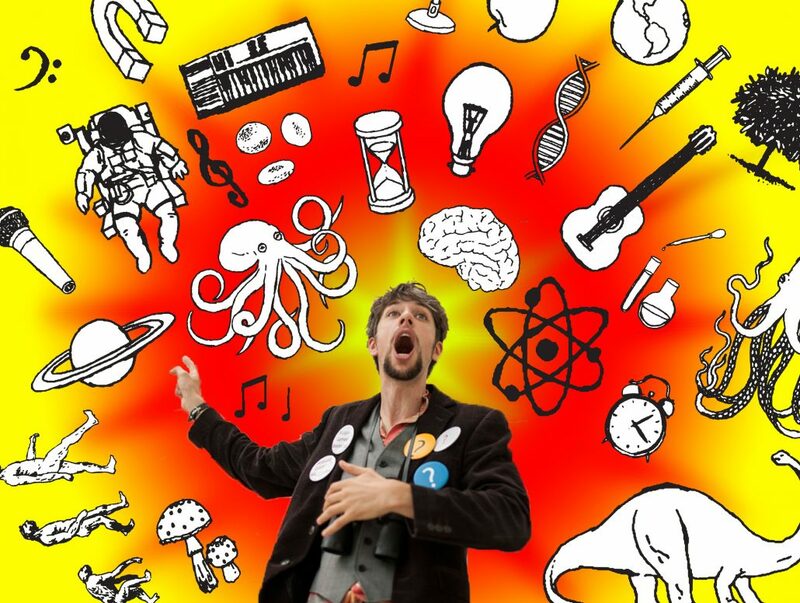 His most recent show is Ensonglopedia of Science, launched in February 2017, which has a song about science for each letter of the alphabet. ** You may notice that I am excluding the plethora of pop songs that use some aspect of science as a metaphor for something else that the songwriter is really writing about, usually love. I do not count these as songs about science, though I do like some of them. A song about science is a song about science.